Our Mission: Community Improvement through business promotion. Social media connectivity with Facebook, Instagram and Twitter. Chamber dues are an investment in a community organization that can accomplish goals that are impossible on an individual basis! A Henderson Chamber of Commerce membership ensures that while you are doing your work, someone is out there doing all the things you cannot be doing to improve the local community. There is a membership level to fit every business and person in the community and surrounding area. Even though Henderson is a small community it is hard to know all of the products and services that each business offers. Through networking events like Business After Hours and Women in Business, members are encouraged to create connections that lead to future sales for each business. The Chamber as an organization is responsible for a number of events that happen throughout the year, including; Henderson Home Show, Henderson Farmers Market, Community Days and the Spirit of Christmas. These events are planned and organized by the Chamber Director and supported by Chamber members through sponsorship donations. Chamber Members have the opportunity to take part in various educational opportunities to enhance their business, their understanding of state legislature, their knowledge of community happening from the county and city level as well as community reports and more. These learning opportunities happen during monthly meetings, women in business meetings, and business after hours. Members also have access to 400+ free webinars to watch at any time that suits their schedule. 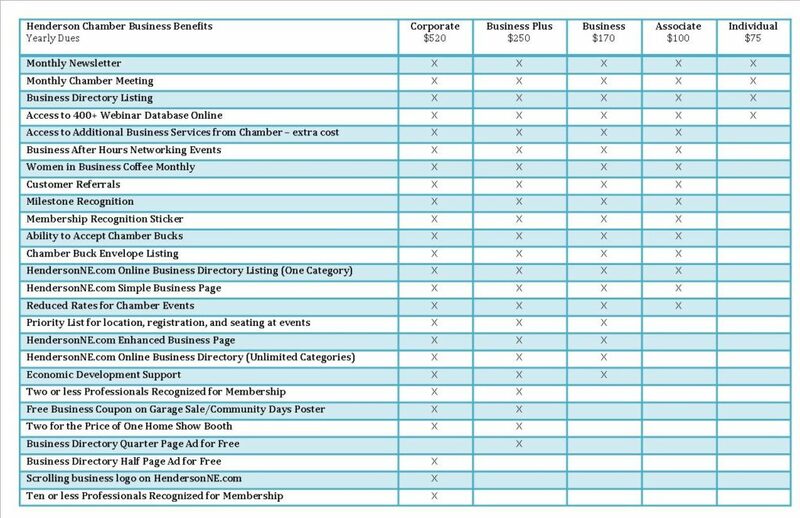 Chamber members are able to take advantage of additional services through the chamber for purchase with their membership such as support for event planning, ribbon cutting ceremonies, articles about businesses, website content development, and more. Chamber members have access to discounts on products and services from fellow chamber members throughout the year. Any member can offer a discount to increase their sales and all members can utilize the discounts to add value to their membership. The Chamber Director works very hard to promote each chamber member through various avenues such as this website, business directory, printed material, referrals, on social media and more. Different promotion benefits are available for each membership level as well as additional paid promotion options. The director also serves as an advocate for Henderson as a community and its businesses on a county, regional and state level from serving on boards with York County Development Corporation to testifying in front of a legislative hearing on the topic of broadband access for rural areas. The Henderson Chamber is part of the Adopt-A-Highway program and teams up with the Heartland FFA each spring to clean to spur from the interstate to Henderson.